The Rebecca Creek Saloon is the newest addition to the Globe Life Stadium in Arlington, Texas. We were lucky enough too be invited in for dinner and a game. This night, the Rangers faced the Oakland Athletics. The stadium was massive and airy, ensuring that the 15,000+ in attendance did not feel crowded. A similar sort of ambiance was present in the saloon. Tall ceilings and tasteful design will immediately strike listeners. We picked up a pair of appetizers that run the range between natural/organic and rich/fried. Of course, there’s a little bit of common ground between the two plates. First up was Rebecca Creek’s Nachos. The dish ($12) is lavished, with ample amounts of queso and lime crema draping fresh chips. A goodly amount of brisket, tomatoes, and roasted poblanos ensure that no two bites are exactly the same. 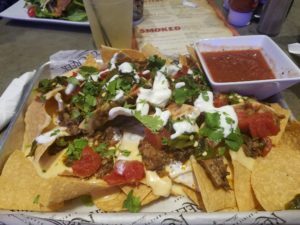 The plate of nachos would whet the appetites of two or three easily. 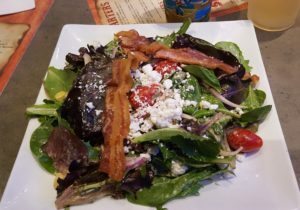 The Greens ($12) is a robust salad that jazzes up the typical salad experience with the addition of grape tomatoes, goat cheese and a bit of crispy bacon that can be added to increasing the crunchiness of each bite. The array of flavors – from the bit of salt added by the bacon to the creaminess contributed by the goat cheese – ensures that one will never have the same bite twice. While at the Saloon, make sure to check out the saloon’s range of spirits. Beyond their titular whiskey, the saloon also offers Enchanted Rock – a vodka – and a peach expression of that spirit. For those looking for a variety of craft beers, the Rebecca Creek Saloon has you covered. Of course, there are the mainline offerings – the Bud, Michelobs, and Coronas of the world – but there are a number of different bocks, pale ales, and lagers that one can delve into. The feast that is the half chicken ($12) will be a daunting challenge for a substantial amount of those sitting down to the dish. The spice blend used on the chicken’s skin – citrus with paprika and oregano – couples with a good smoked flavor. The meat remains juicy, with the crispy skin acting as the perfect counterpoint. For individuals like us (who came from Ohio initially), the authentic Mexican-style corn was a nice change of pace. 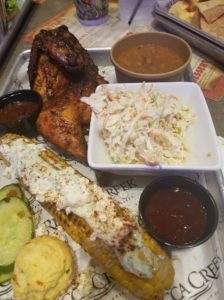 Additional sides – a warm, crumbly corn muffin and quick pickled cucumbers – provide additional nuance to the plate. The Rebecca Creek Bacon Jam Burger was cooked exactly to our specifications. A flavorful blend of burger is utilized here, while an ample amount of goat cheese tops the meat. The dish is melded together with a jam that matches bacon with the distillery’s whiskey.Coupled with the Saloon’s huge, fresh-cut fries, one will be in a blissful haze of satiety after this meal. Our toddler was sated with a 1/4 pound burger ($10) and will have to try out the Saloon’s other options – chicken bites, a hot dog, or a chicken and cheese taco – the next time we make it to the Globe Life Park. 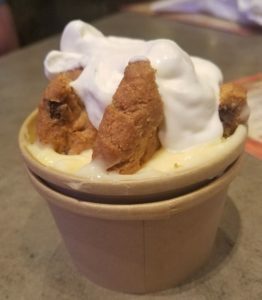 To put a proper finish on our meal, we were treated to a Banana Cream Pudding with dipping-sized wedges of cookies. 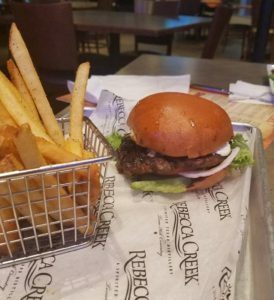 For anyone that is watching a Rangers game and is hungry in the slightest, the Rebecca Creek Saloon is a perfect place to re-charge and cool off before they go back in the stands.